It was Bertrand Russell, the 20th century English-American philosopher that declared, "Some people would rather die than think". His assertion is so apt in today's Nigeria where deep thought seems to have been anathemised. In this isle of ours today, pedestrianism seems to have been elevated to national creed; herd mentality rather than introspective thought holds sway. Hate is rife; unreason is celebrated. Careless talk is free but free thought is opprobrious; free speech has hibernated. Balderdash dominates national discourse; charlatans have become philosophers; blank-heads are now beacons of thought. We are simply in a season of riot of values. What is the easiest way to dominate a people? Give them ignorance! So, we happen to be citizens of 2017 Nigeria; a Nigeria that happens to have an Nnamdi Kanu. An Nnamdi Kanu who is a philosopher of a kind, a rabble-rouser, a gadfly and the tsetse fly in Nigeria's mainstream politics. An Nnamdi Kanu who has dared to think, to question and to disagree. An Nnamdi Kanu who has dared to say no Nigeria. An Nnamdi Kanu who has questioned the grund norm, the social contract binding Nigeria. What a man! In the history of thought, there are three well known philosophers of social contract, but two dominate the theories of state due to their diametrically opposing views. While Jean Jacques Rousseau, John Locke and Thomas Hobbes stand out as theorists of social contract, Thomas Hobbes and John Locke dominate the discourse on social contract due to their irreconcilably opposing views on the relationship between the citizenry and the state. For Thomas Hobbes, the state is the Leviathan, the almighty. Before the formation of the state, life in the state of nature was nasty, brutish and short. Man was woe unto man; men's existence was characterized with violent chaos. It was therefore, a miracle that a sovereign emerged on the scene, overpowering the warring factions and demanding that the citizenry submit all their rights to him in exchange for protection. According to Thomas Hobbes, the citizens gratefully surrendered their rights to the sovereign in exchange for order and statehood. Therefore, the citizenry have no rights except those thus declared as such by the state. There is no gainsaying that this social contract theory is agreeable to a sizeable number of Nigerians, especially those who might want Nnamdi Kanu locked up and the keys thrown into the belly of the Nineveh shark that swallowed Noah for good riddance. For those who ascribe to this school of thought, Nnamdi Kanu has committed the unthinkable by daring to question the foundations of Nigeria. But John Locke disagreed entirely with Thomas Hobbes. For Locke, in the state of nature, life was blissful and full of mutually respected liberties. Men so much respected these liberties that they appointed a sovereign for the sole purpose of safeguarding these liberties. In other words, the state is a creation of the citizenry for the purpose of the protection of the liberties so cherished and so jealously guarded by the citizens. For John Locke, the state is at the service of the citizens. Its job is the protection of the liberties of the citizens. Now, John Locke comes up with a caveat emptor, "Any day the state ceases to protect these rights, it becomes the civic duty of the citizens to rise against it". Thus spoke John Locke. He postulated that the citizens are bound by civic duty to embark on civil disobedience should the state become dictatorial. For Locke, the sovereignty of the state does not lie in the instruments or agents of the government but in the will of the people. The state loses legitimacy according to Locke any day it ceases to serve the interests of the people. What then is the social contract according to Nnamdi Kanu? 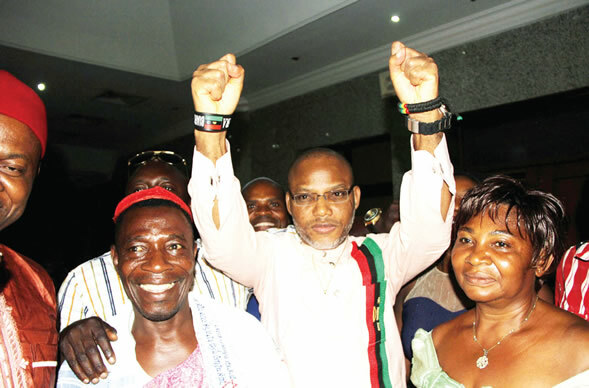 In essence, the social contract according to Nnamdi Kanu can be depicted thus: Free citizens of equal rights who have been unwillingly brought together by the force of British colonial will to power; who have been unequally placed in the state where there are unequal rights and unequal privileges among the peoples that constitute the state should have the opportunity to willfully decide on our association by way of a referendum. It is obvious that Nnamdi Kanu queues behind the John Locke's tradition of social contract. First, the state is not divine entity but a product of history. It is neither indissoluble nor unrenewable . Like all products of history, the state is subject to change. In the case of Nigeria, it has not always existed as a nation. Its history is relatively recent. Its creation was a Leviathanic fiat of the British colonial authority. It was neither a product of popular democracy nor a creation of the freewill the indigenous people that abide in the area. Whether the union will be subject to choice or not will be determined by laws and forces of history. Kanu seems to be essentially calling for an opportunity to decide on the union. Others have made similar calls in varying degrees. Some have called for true federalism while some others have called for the restructuring of the country. At any rate, history will decide how all these will play out. The point however is that the current agitations are neither peculiar to Nigeria nor are they new to history.